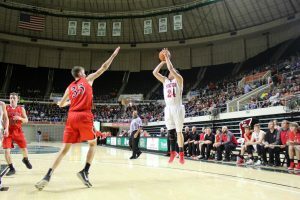 The Piketon Red Streaks (18-5) defeated the Alexander Spartans (13-10) on Saturday in Ohio University’s Convocation Center to advance to the district finals after a furious fourth quarter comeback. Piketon had stagnation issues throughout the first three quarters of play, with head coach Evan Legg audibly urging his players to move and be more active. The lack of energy contributed to the Red Streaks managing only 4 points in the second quarter and 9 points in the third. Alexander, meanwhile, played smothering team defense, being able to both collapse on any penetration and quickly recover to shooters on kick out; the Spartans also capitalized on several lackadaisical passes and reckless drives to create steals and charges. On offense the Spartans benefited from these extra possessions, an advantage that was compounded on by their tough offensive rebounding. 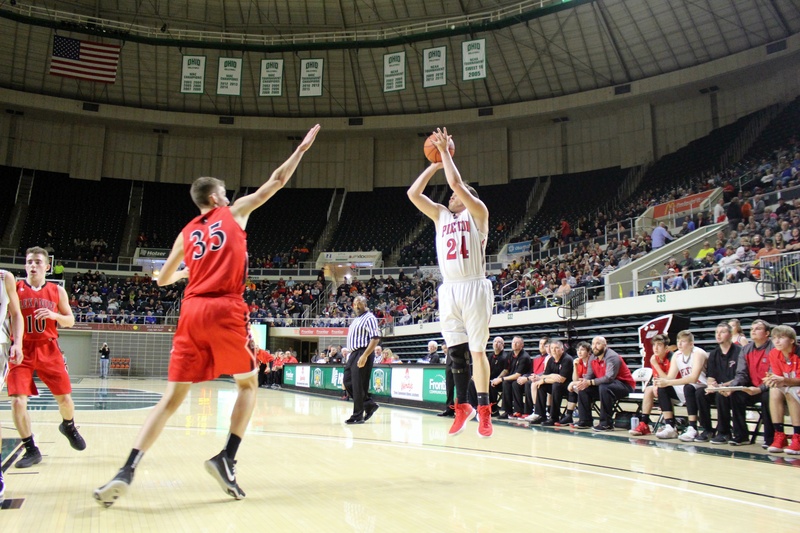 The Spartan lead was 10 at the half and 12 before momentum began to swing in Piketon’s favor. The game began to get away from the Spartans with only 4:20 remaining in the game, as Alexander’s Ryan Davidson received a technical foul, leading to a five point swing as the Red Streaks made both technical free throws and a 3-pointer on the ensuing possession. From there, the Spartan’s offense sputtered while the Red Streak’s surged, as Piketon would then go on a 10-1 run to take a two-point lead with only the game’s final few minutes remaining. A second technical foul issued to Alexander’s bench gave Piketon a buffer, and shortly thereafter the Spartans resorted to intentionally fouling. Senior Tanner Perdue would go on to seal the game, making his free throws every time he was sent to the line. Perdue finished the game with 27 points and 10 rebounds. Alexander was led by Dylan Mecum’s 13 points and Jk Kearns contributed 8 points and 6 rebounds. With Mecum being a junior and Kearns being a sophomore, Alexander can look past this loss and into a bright future. The Piketon Red Streaks will next take on the Wheelersburg Pirates in the district finals.